Ya'Ke Smith, awarding filmmaker, is known for unflinching and veracious storytelling regularly earning critical acclaim. His work has been screened at over 90 film festivals, as well as featured on HBO, Showtime, BET, and PBS. NPR called his debut feature, WOLF, "an impressive piece," after its SXSW premiere. His short film Katrina's Son, won 14 awards and was eligible for the 2012 Avademy Award in Short Filmmaking. His latest film, Heavenly, a short version of his award-winning screenplay of the same name was recently completeted. Mr. Smith is currently an Associate Professor of film at The University of Texas at Austin. 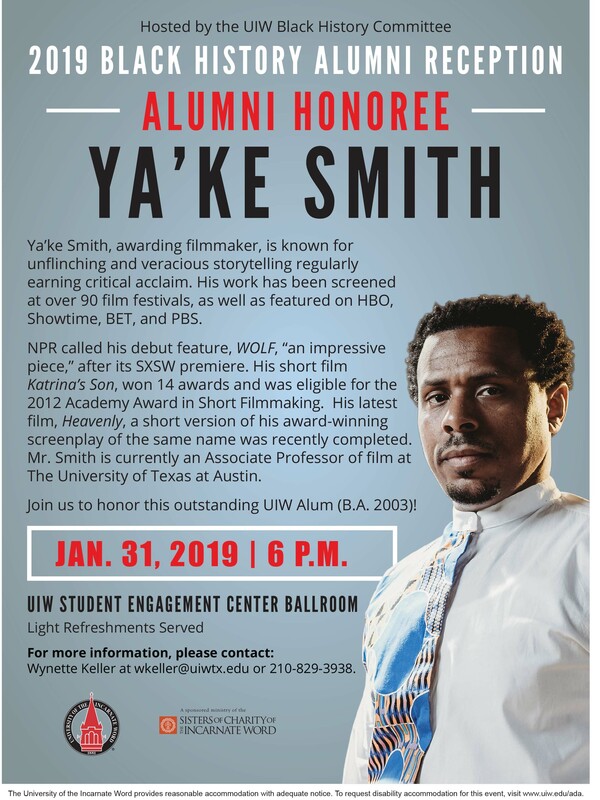 Join us to honor this outstanding UIW Alum (B.A. 2003)! January 31, 2019 | 6 p.m.